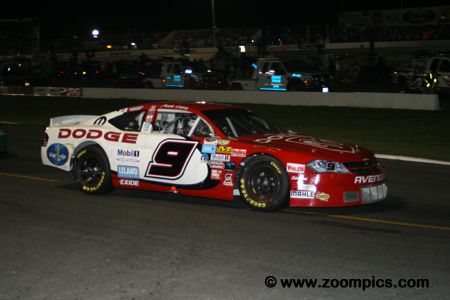 Round eleven of the 2008 NASCAR Canadian Tire series was held at Barrie Speedway on the 1/3-mile oval track. Drivers would compete for 300-laps in a race sponsored by Pizza Pizza. A late race caution for debris on the track resulted in a ‘green-white-checker’ finish and an extra lap for competitors. 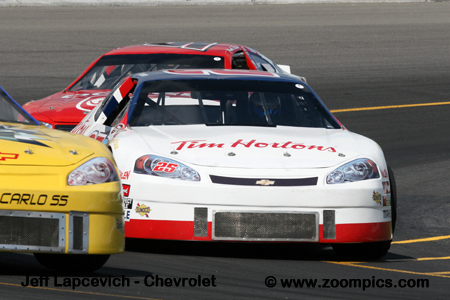 Twenty-two cars are gridded on Barrie Speedway’s front straight for the Pizza Pizza 300. The fastest qualifier was the No. 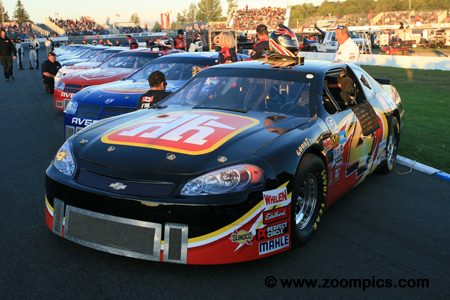 4 Home Hardware sponsored Chevrolet Impala SS of Don Thomson, Jr. This was Thomson’s sixth pole of the 2008 season. Sharing the front row with Thomson, Jr. is Dave Whitlock in the Dickies Dodge Avenger. The point’s leader, Scott Steckly was in need of a good finish after a string of poor results on the ovals. Steckly started fourth driving Erb Group Dodge Avenger and immediately moved into contention. On lap-247, he slid into the race leader, Don Thomson, Jr. causing him to spin. Steckly took first place and despite being challenged by Kerry Micks in the final laps, he held on for his fourth victory of the season. The No. 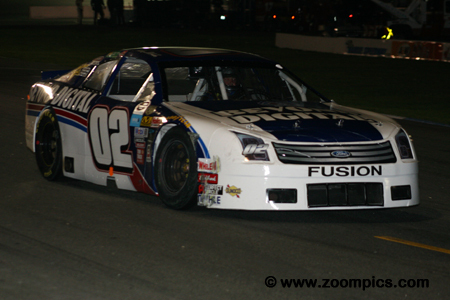 02 Beyond Digital Imaging Ford Fusion was driven by Kerry Micks. Micks started fifth but two separate incidents sent him to the rear of the field. Despite these setbacks, he worked his way back to the front. Debris on the track, with two laps to go, caused the officials to display the yellow flag. This allowed Micks to close on the leader, Scott Steckly but he was unable to pass him and finished second. 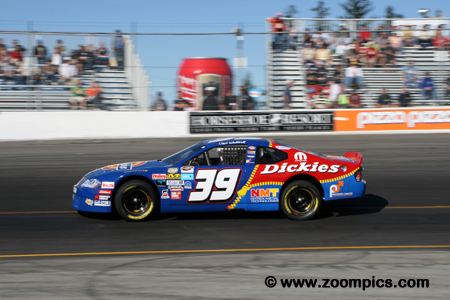 The Pizza Pizza 300 was Don Thomson’s sixth pole position of the 2008. Unfortunately, Thomson had only one victory to show for his efforts. 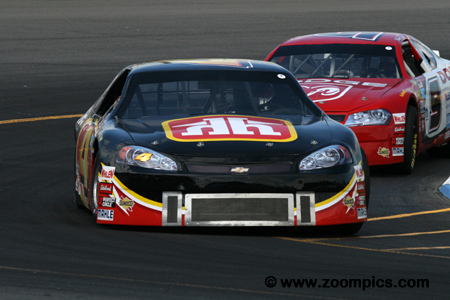 He remained in contention during the race and took the lead from Scott Steckly for the final time on lap-246. Thomson’s run out front only lasted one lap before contact with Steckly caused him to spin. He drove through the field and managed to finish third. 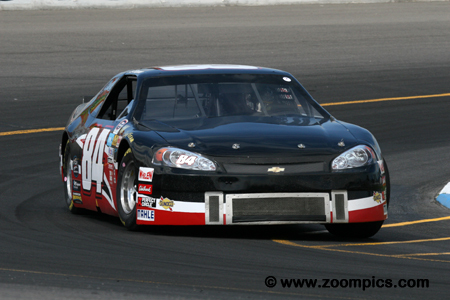 Stock car veteran, Dave Whitlock started on the outside of the front row in the No. 39 Dickies sponsored Dodge Avenger. On lap-238, Derek Lynch spun coming on to the main straight and the front left of his car made contact with the right front of Whitlock’s Dodge. Whitlock drove over the top of Lynch’s car and rolled twice – landing upside down. Whitlock was not seriously injured but his race was over. 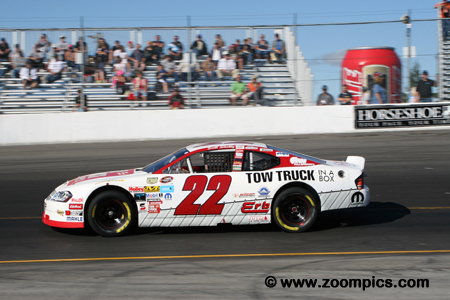 The defending NASCAR Canadian Tire Series champion, Andrew Ranger was third in the title chase but his results had been mixed during the 2008 season. Highlights included a pole at Edmonton and victories at Montreal and Trois-Rivieres but many times he finished in the middle of pack. Barrie would not be one of the high points of his year – he qualified eighteenth quickest and finished twelfth. Barrie resident, Mark Dilley drove the No. 9 Dodge Avenger with backing from Leyland Industries. 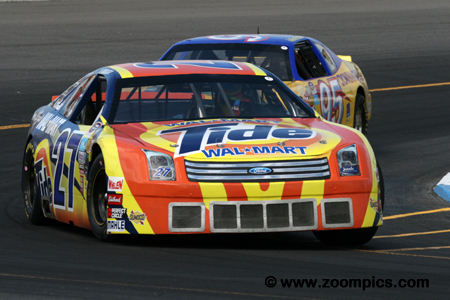 Dilley entered round eleventh sixth in the standings. To date his season included the ‘highest of highs’ – a victory at Cayuga and the ‘lowest of lows’ – a clutch failure at Mosport where he was the first retiree of the race. At Barrie Speedway, local track knowledge helped him qualify third and finish fifth. Only once did J.R. Fitzpatrick fail to qualify in the top-ten (the first event a Barrie) in fact, he often started in the top-five. Unfortunately, Fitzpatrick’s race results did not match his qualifying performances. He won the second round at Mosport but only had two other results in the top-ten (St. Eustache and Montreal). Fitzpatrick started fifteenth at Barrie he managed a sixth-place finish.